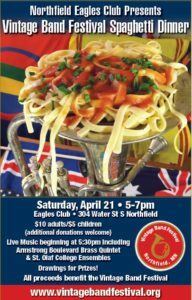 Northfield, Minnesota—The Northfield Eagles Club will be hosting a benefit spaghetti dinner as a fundraiser for Vintage Band Festival 2018. The event will take place, Saturday, April 21, 2018 from 5:00pm – 7:00 pm at the Fraternal Order of the Eagles Club, 304 Water Street South, Northfield. Dinner will consist of spaghetti with marinara sauce and parmesan cheese, salad and sliced bread. Cash bar will be available and live music will be presented throughout the evening. The highlight of the evening will be the announcement of the band roster for the one-day Vintage Band Festival in July. There will also be several drawings for door prizes. 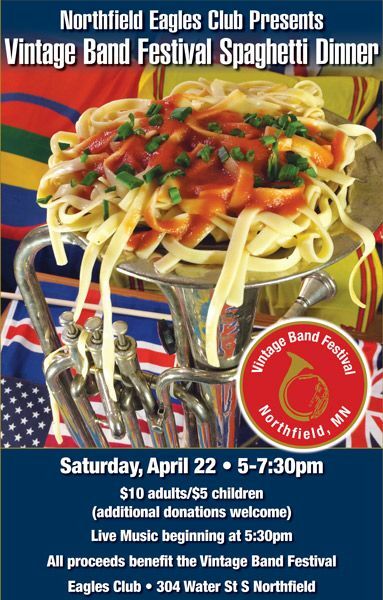 Vintage Band Festival 2018 will take place in Northfield July 28, 2018. Music will run from 9am-10pm in Bridge Square. Details of the 2018 festival can be found at www.vintagebandfestival.org. This entry was posted in Fundraising, VBF News and tagged Northfield Eagles Club, VBF 2018 on March 18, 2018 by Paul Niemisto. Thursday, November 16, is Give to the Max Day in Minnesota. Vintage Band Festival is participating in Give to the Max Day 2017. Conveniently, #GTMD17 coincides with the Vintage Band Festival fall fund appeal now underway. Any gift made on or before Nov. 16 will allow organizations to be eligible to win hourly and daily drawings for additional winnings. That could mean more dollars for Vintage Band Festival! Every day from November 1 -15 one organization will win $500 because one or more supporters scheduled their gift in advance. That could benefit Vintage Band Festival! Each hour on Give to the Max Day, a drawing will determine the winner of a $1,000 Golden Turkey Award. The winner can choose which cause will receive the $1,000. Donations from donor advised funds or other appreciated assets may now count toward Give to the Max Day. Help your favorite causes rise up the Leaderboards and have the chance to win a Golden Ticket by making a gift from your donor advised fund or financial portfolio. This entry was posted in Fundraising, VBF News and tagged #GTMD17, Give to the Max Day 2017 on November 12, 2017 by Dan Bergeson. The following letter was recently sent to the Vintage Band Festival donor base. Since many website visitors are not yet donors, the letter is reprinted here for their information. 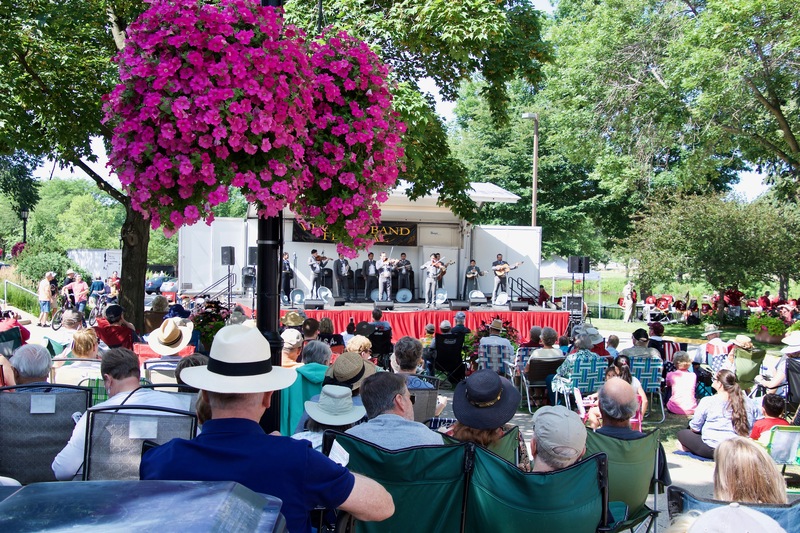 The tenth anniversary four-day Vintage Band Festival happens July 28-31—just three months away. The band roster and the performance schedule have been finalized. There will be 31 bands and about 100 concerts. Our last four-day festival, in 2013, attracted 15,000 attendees, and the diversity of bands and music repertoires was amazing—the festival has become a major event in this region and nationally. The lion’s share of the approximately $100,000 in funding for the festival comes from hundreds of gifts by local individuals, an astonishing example of cross-community collaboration. In addition to making cash gifts, Northfielders host band members in their homes, set up and take down at performances, and give hours of their time locating resources beyond cash so that the whole project can come to pass. We house visiting bands that travel long distances to Northfield in Carleton College facilities at our expense. Since several of the bands will stay 3-4 nights this summer we will need to fund approximately 300 nights at $35/night. A gift to fund five nights would be $175; ten nights $350, and so on. The largest part of our budget is the fees we pay to get some of the best and most unusual bands to come to the festival. Some nearby Minnesota bands do not charge us a fee but we will be paying 20 bands a total of $33,750 for this summer’s festival. A gift of any amount will help with these costs, but for a gift of $1,000 we would designate you in our publicity as the sponsor of a specific band. Checks can be made out to Vintage Band Festival at 204 W. 7th St. #130, Northfield, MN 55057. Credit card donations can be made by clicking the big green “DONATE” button on our website www.vintagebandfestival.org. Thank you most warmly for your consideration of this request. Let the music begin! This entry was posted in Fundraising on May 14, 2016 by Dan Bergeson. 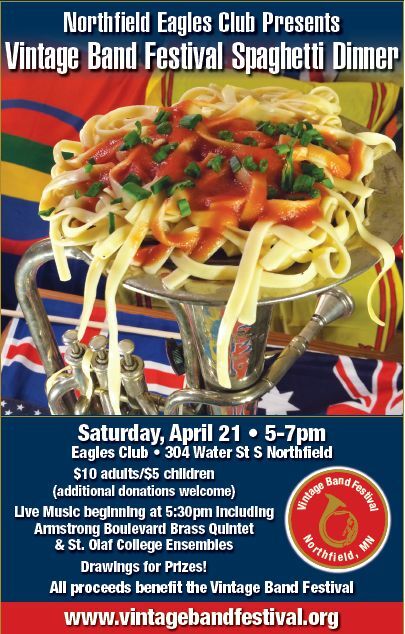 Northfield, Minnesota—The Northfield Eagles Club will be hosting a benefit spaghetti dinner 2016 VBF Poster Spaghetti Dinner as a fundraiser for Vintage Band Festival 2016. The event will take place, Saturday, April 23, 2016 from 5:30pm – 7:00 pm at the Fraternal Order of the Eagles Club, 304 Water Street South, Northfield. Dinner will consist of spaghetti with marinara sauce and parmesan cheese, salad and sliced bread. Cash bar will be available. Local area scouts will be serving the dinner. Live music will be presented throughout the evening. There will be three ensembles playing for the dinner guests: student musicians from St. Olaf College at 5:30, Bridge Square Band at 6:00 and an ensemble of student musicians from Northfield High School at 6:30. 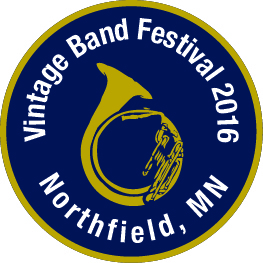 Vintage Band Festival 2016 will take place in Northfield July 28-31, 2016. 30 bands will play over 100 concerts in Northfield and surrounding communities during the 4-day festival. 2016 is the 10-year anniversary of Vintage Band Festival. Details of the 2016 festival can be found at www.vintagebandfestival.org. This entry was posted in Fundraising, VBF News on April 12, 2016 by Dan Bergeson. Our second one-day event on August 1 was a tremendous success. 12 bands played on the Bridge Square stage during the 12-hour festival and donations from the audience reached $8,000. Thanks to Riverwalk Market Fair for another fruitful collaboration! On August 3, 2015 Vintage Band Festival was able to meet all of its past obligations, pay for the expenses of the 2015 one-day festival and continue into the fall with a positive cash balance. Since that time, additional donations and grant awards have resulted in a cash balance of $20,000. Since the projected budget of the 2016 festival is approximately $100,000, $80,000 remains to be raised. We plan to accomplish this with a combination of grants, business sponsorships and appeals to VBF friends like you! 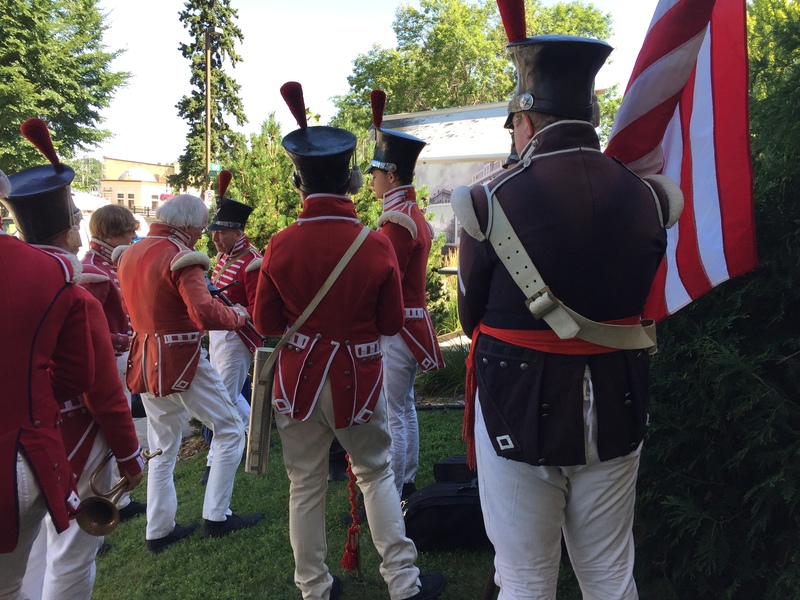 VBF sponsored the music for the reenactment of the 150th anniversary of the 2nd Minnesota Infantry’s homecoming at historic Fort Snelling on August 15. Thanks to The Manitou Regimental Band for a fabulous job! VBF hosted three amazing educational programs during the fall. On September 28 Paul Maybery gave a presentation on the history of brass bands in the United States. William Crowder, “Bugler Bill”, was in period dress on October 26 and demonstrated dozens of bugle calls in a “day in the life” of the United States Army infantry. On November 23, Joy Riggs read from her forthcoming biography of her great grandfather, G. Oliver Riggs, a real-life music man. Thanks to our friends at the Northfield Retirement Center and the Northfield Senior Center for being great partners in this effort. Jesse Streitz joined the Board at the November meeting. Jesse is a recently retired local business owner and a fine clarinetist. Welcome Jesse! Jim Haas, VBF Treasurer, announced his plans to resign from the Board at the end of 2015. Thanks to Jim for his outstanding work during the past two years! Southeastern Minnesota Arts Council awarded Vintage Band Festival a $10,000 Arts and Culture Heritage Grant in November. The money will be used to support the participation of a number of Midwest bands in the 2016 festival. Thanks to Board Secretary Joy Riggs for her successful grant application. Please consider a year-end tax-deductible donation to Vintage Band Festival. You can make a secure donation on our website, vintagebandfestival.org, or send a check to Vintage Band Festival, 204 W. 7th St.., Box130, Northfield, MN 55057. This entry was posted in Ancillary Vintage Events, Fundraising, Grant Awards, Historical Narratives, VBF News on December 21, 2015 by Dan Bergeson. Vintage Band Festival is pleased to announce that on November 17, 2015 VBF received a $10,000 Arts and Culture Heritage Grant from the Southeastern Minnesota Arts Council (SEMAC). This grant will be used to support several Minnesota bands that will be appearing in the next Vintage Band Festival July 28-31, 2016. SEMAC awarded 38 grants in this cycle for a total of $234,460 in funding to applicants throughout southeastern Minnesota. This included eight Presenter/Production Assistance grants for $22,500, eight Small Towns/Rural Areas grants for $19,605, and 22 Arts & Cultural Heritage grants for $192,355. Many thanks for the efforts of Joy Riggs, Vintage Band Festival Board member and Secretary, for her fine work in writing a successful application. This is the second SEMAC grant that Joy has written. The first was a $4,000 General Operating Support grant awarded in August 2015. This entry was posted in Fundraising, Grant Awards, Uncategorized on November 24, 2015 by Dan Bergeson.